Carry the plant protection products in safe lockers on the sprayer. It must be possible to collect any spillage that may occur from the containers. When filling the sprayer with water, avoid any risks of over flow or return to the water source. At the same time, special care must be taken that no spillage could end up in drains, wells, ditches or surface water unless the filling takes place on a special concrete area with efficient drainage to a safe container. In practical life it is safest to fill the sprayer from a separate water tank  or if filling directly from a public or private water supply makes sure that the end of the filling hose is positioned minimum 4 inches above the sprayer filling hole. 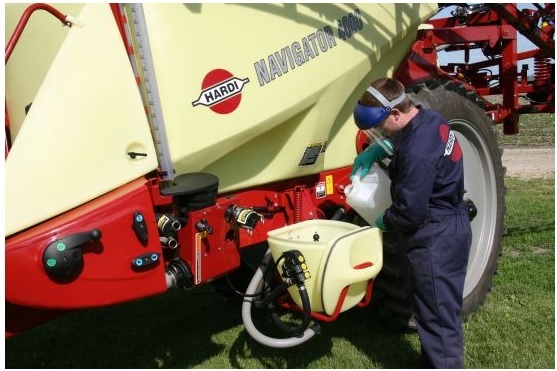 The sprayer must not be left unattended while filling  to avoid overflow or other spillage. Sprayer filling must not take place anywhere near wells or drills  please look up local guidance. To minimise the impact on the environment due to smaller spillages or dripping always on the same spot, the water filling should preferably take place in the field. If filling water at the farm, an area covered with grass is preferred to that of stones or gravel. The safest alternative is to carry out the filling under a roof and with drainage to a separate tank. Filling of the plant protection products should also take place at varied places in the field. Transportation of the concentrated chemicals between farm and field must be safe and according to the local rules. In practice, it is recommended to transport the plant protection products in a locked box where it is possible to contain any spillage that may occur. A shovel and plastic sack may also be a wise precaution for they can be used to pick up any spillage of concentrated chemical if lost on the ground. If filling plant protection products home on the farm it should take place on a concrete area where it is possible to pick up any spillage using special absorbent granules. If this is not possible then fill over a dedicated grass area that will help degrade any spillage. The sprayer pump should be off when transporting the sprayer from farm to field  to ensure the system is not under pressure. When the agrochemical container is empty it must be rinsed either with the rinsing nozzle in the chemical filler or with 3 lots of clean water. In both cases it is important to move the container to make sure the rinsing is fully efficient. If using a ringing nozzle - the time used for rinsing a container - must be adjusted to the container size and an extra rinse with clean water afterwards will ensure that the container is as clean as it can be. The rinsing water must be added to the main spray solution. The rinsed containers are stored securely in a lockable area.